Ask RP Photonics for advice on which laser source is best suited for generating pulses with given parameters, or on how to characterize optical pulses. By modulating a continuous-wave light source, e.g., with an electro-optic modulator, pulses with durations from some tens of picoseconds to arbitrarily high values can be generated. Pulse durations from Q-switched lasers typically vary between 100 ps and hundreds of nanoseconds. Mode-locked lasers can generate pulses with durations between ≈ 5 fs and hundreds of picoseconds. High harmonic generation allows the formation of single attosecond pulses or attosecond pulse trains, with pulse durations of a few hundred attoseconds or even below 100 as. The most frequently used definition is based on the full width at half-maximum (FWHM) of the optical power versus time. This is not sensitive to some weak pedestals as often observed with optical pulses. For calculations concerning soliton pulses, it is common to use a duration parameter τ which is approximately the FWHM duration divided by 1.76, because the temporal profile can then be described as a constant times sech2(t / τ). For complicated pulse profiles, a definition based on the second moment of the temporal intensity profile is more appropriate. Particularly in the context of laser-induced damage, one sometimes uses an effective pulse duration, which is defined as the pulse energy divided by the peak power. The product of pulse duration and spectral bandwidth is called the time–bandwidth product. Typically, is calculated using FWHM values of duration and bandwidth (see above). It can not be much smaller than ≈ 0.3, depending on the pulse shape and the exact definition of pulse duration and bandwidth. This means that e.g. a 10-fs pulse must at least have a bandwidth of the order of 30 THz, and attosecond pulses have such a large bandwidth that their center frequency must be well above that of any visible light. See also the article on the transform limit. Pulse durations down to roughly 10 ps can be measured with the fastest available photodiodes in combination with fast sampling oscilloscopes. For the measurement of shorter pulse durations, streak cameras can be used. Another approach is optical sampling (or cross-correlation), using another source generating even shorter pulses. In most cases, however, one uses optical autocorrelators. Note that there are also techniques such as FROG or SPIDER (→ spectral interferometry), which can be used to obtain much more information on pulses than e.g. 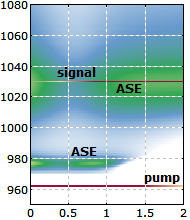 just the pulse duration and energy; see the article on pulse characterization. The spatial width of a pulse in the propagation direction is given by the group velocity times the temporal pulse width. Despite the high velocity of light, ultrashort pulses can also be very short in the spatial domain. Whereas e.g. a 1-ns pulse still has a length of ≈ 30 cm in air, the shortest pulses which can be generated directly with a laser – with a duration of roughly 5 fs – have a spatial length of just 1.5 μm in air or vacuum. This corresponds to only a few wavelengths, or temporally a few optical cycles (few-cycle pulses). As the transverse dimensions, characterized e.g. with a beam radius, are usually much larger than that, few-cycle pulses can be imagined to be like pancake-shaped bullets of light. This aspect is important; it explains e.g. why the apparent pulse duration as measured with an intensity autocorrelator can be increased when this measurement apparatus involves pulses crossing each other at some significant angle. Chromatic dispersion can lead to substantial pulse broadening, which can however be reversed by subsequently applying the opposite kind of dispersion (→ dispersion compensation). Nonlinearities would normally not directly affect the pulse duration, but can e.g. broaden the optical spectrum, which makes the pulses more sensitive to chromatic dispersion during subsequent propagation. Any type of optical filter, including a gain medium with limited gain bandwidth, can affect the spectral width or shape of an ultrashort pulse. When the spectral width is reduced, this may lead to temporal broadening, even though there are cases where strongly chirped pulses become shorter when their spectrum is made narrower. In the steady-state operation of a mode-locked laser, the circulating pulses experience various effects which affect the pulse duration, but these effects are in a balance, so that the pulse duration is restored after every round trip. 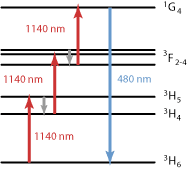 In some femtosecond lasers, the pulse duration undergoes substantial changes during each resonator round trip. The definition and measurement of the pulse duration becomes considerably more complicated in cases where spatial and temporal pulse properties are coupled with each other. An example is the phenomenon of pulse front tilt, where a locally measured pulse duration may be smaller than a duration based on the whole beam profile.